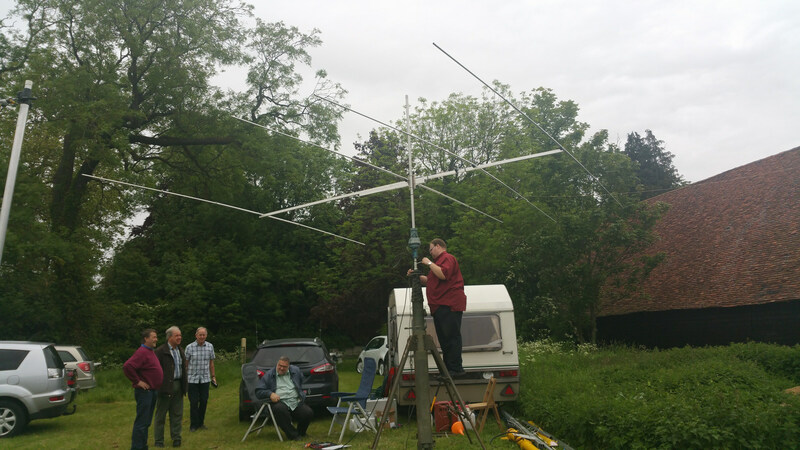 Members of the Havering ARC took part in the LEFARS radio event over the bank holiday weekend 23/24/25 May provided the ideal opportunity to test the beam. George M1GEO and Chris G8OCV provided the 12m SCAM mast and so the fun began. 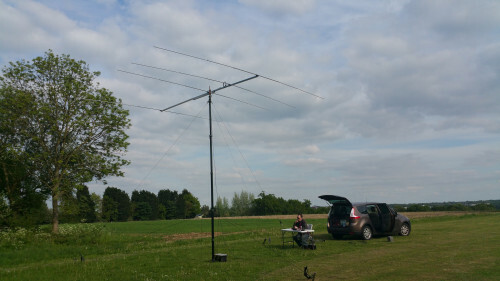 The club operated from a farm site in Harlow, giving us enough space to test even the most ambitious projects. As described in parts #1 and #2 the antenna has a 5 meter boom, and although it isn’t too heavy it still provides a challenge lifting this onto the mast. 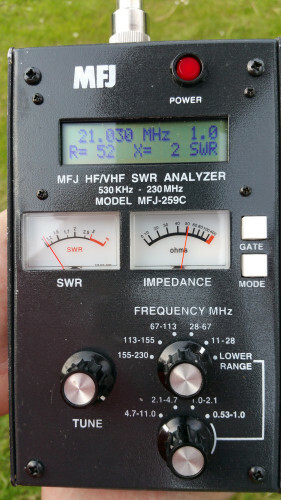 Once again a quick VSWR check using the MFJ antenna analyser suggested it was ready to go, and so the next phase was to pump up the mast. 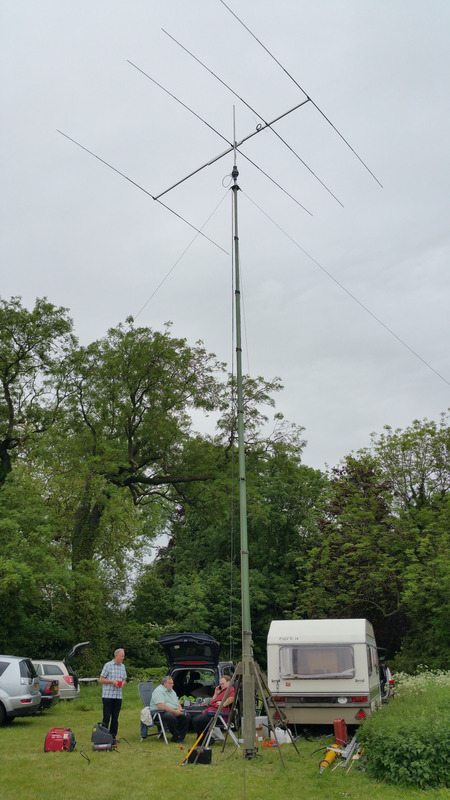 The Scam provides 12m (45ft) of elevation, and provides a suitably robust (heavy) construction that makes it a firm favourite for our HF field days. The station was a Kenwood TS990 and Explorer 1200 Amplifier. Here is a picture of George M1GEO working a pile up. Over the course of the next 3 days we were able to test the antenna, band conditions seems reasonable on the day and improved early evening on most days. We found the directivity to be good, and pointing towards Japan in the early evening provided a pile up of JA’s calling us. We also found conditions very good into the USA late evening and working West coast with signals 59+ was quite a surprise. 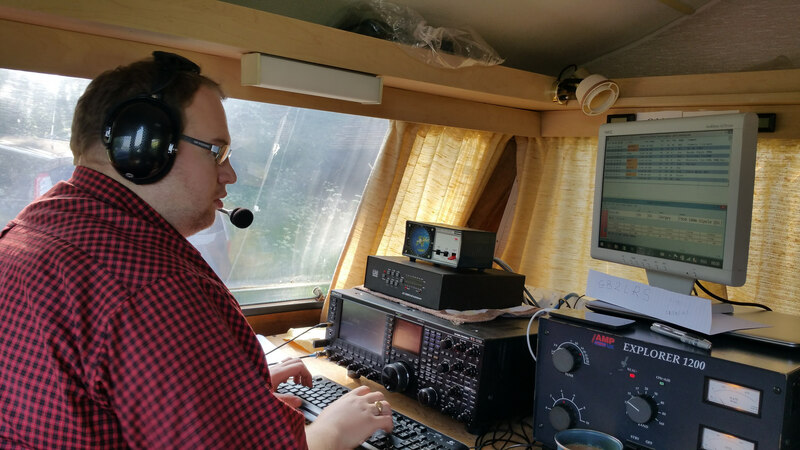 It was also nice to see the GB2LRS station generating some interest on the HF band, with one USA station suggesting the phonetics should be GB2 Loud Radio Station ! The USA and JA pile ups were quite a surprise, listen to one here and see what you can pull out. The the weekend finally coming to an end on Monday we had worked 600 stations in 58 countries, the highlights being A9 Bahrain, C6 Bahamas, BY China, VU India, HI Dominican Republic, EP Iran, P2 Papua New Guinea, KL Alaska, XE Mexico, and YB Indonesia. The top two countries in the log were 376 Q into USA and 71 into Japan. I think given the quantity and quality of stations worked this weekend I can now declare the 4E mono band for 21 MHz a success. Thanks to everyone who worked us and made the weekend possible. Now the exciting phase, nearing the end and a moment to complete the final stages. Construction of the matching phase, and mounting the driven element. 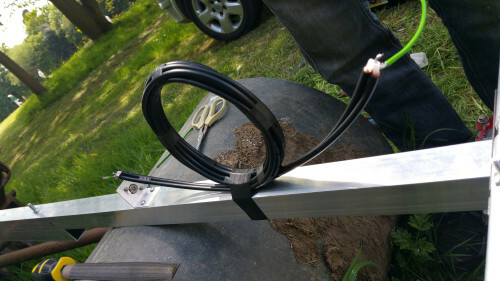 The antenna feed point is 28Ω, and the method of feeding the antenna is described on DK7ZM site. Once constructed from 2 lengths of 75Ω and formed into a choke this could be mounted. The driven element was separated with a solid plastic tube, this extended 250 mm into each side of the element. The bolts and wing nuts would provide the ideal termination point for the coax. The next phase was getting the aerial into the air, and checking the VSWR. The design suggested it was quite broadband, and as you can see it was 52Ω @ 21.030 MHz. A little lower than planned, but it was 1:3 at 21.250 MHz and so well within design. The band seemed quite lively, and we could hear a special event Indian station working a huge pile up of EU and NA. Despite calling a few times we wasnt able to make that, but a little further down the band we did hear VK and a Taiwanese (well he was from Leeds) working a few. After finding a frequency and calling CQ we was able to work WA7M Gavin in Arizona USA. 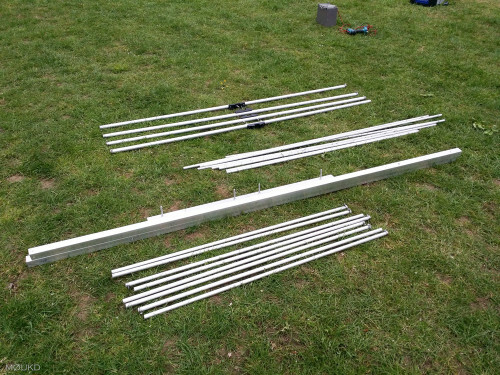 Months ago I ordered some aluminium in preparation for another antenna project. 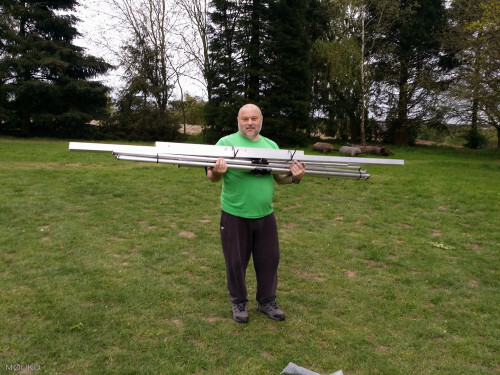 Wtih the assistance of John M0UKD the plan was to build a 21 MHz 4E Yagi. The aluminium was ordered from aluminium warehouse, and cost around £100 including delivery. The on-line shop provides and delivers lengths of up to 5 meters, and they have a vast selection of grades and lengths available. The design was by DK7ZB and was chosen because of the short boom length and high gain. 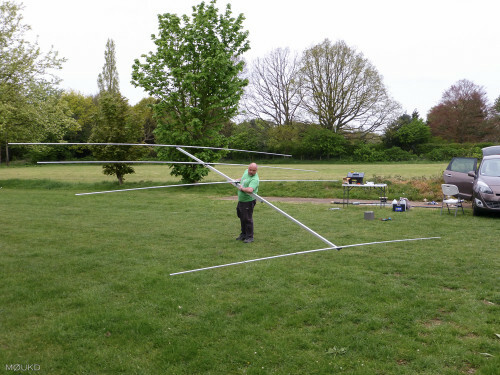 The boom is 5 meters, and made from 40mm box split into 2 x 2.5m. 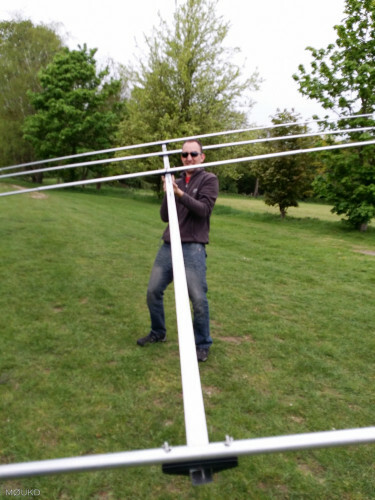 The reflector is 7.2 meters long and director 2 is 6.4 meters long (to give you some scale) You will find all the measurements, VSWR and gain data on Martin’s very extensive website. The antenna construction involves sections of the elements telescoping into each other, and Martin points out this is a critical part of the design. The aluminium was ordered with this in mind, and while some sections required no adjustment others didnt quite go to plan. We needed to “grind” some of the sections just a little, to ensure they would fit and telescope correctly. This part of the construction required 1 complete grinding disc and around 2 Hrs. work ! Once each section that required attention was ground down, the elements were mounted on the boom. I used various places to source all the parts but some on-line resources have been linked. As with any home construction project you always get some unexpected challenges, the first was how to get the elements to lay flat on the plastic formers. 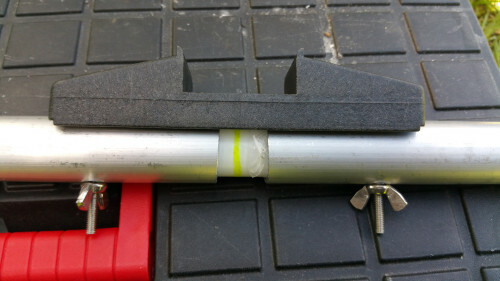 The former needs to be mounted to the boom by a nut, and this isnt easy to recess, meaning we had to cut a small hole to locate the nut into the element, allowing the element to lay flat. With this type of beam it presents 28Ω (by design) and so requires a coax matching section. This is yet to be constructed, but the final build phase will include this and mounting the driven element. You can see the progress so far, and further updates and pictures will be posted once tested.